JEFFERSON, WI (Saturday, May 19, 2012) Stoughton’s Casey Johnson survived an early incident and led every lap of the B&M Electric 50 lap Late Model feature at Jefferson Speedway on Saturday night. Johnson saved his best for last as he overcame a late caution and held on to get the win, his first of 2012. Starting on the front row alongside Brady Liddle, Johnson grabbed control of the top spot on lap two as he slid up in front of Liddle down the backstretch. A lap later, Johnson and Liddle touched entering turn one which sent Johnson spinning and forcing the first caution of the event. Liddle subsequently claimed responsibility for the incident allowing Johnson to retain his lead and forcing Liddle to the rear for the restart. As racing resumed, the leaders remained single file with Johnson out front followed by Shaun Scheel in second and Bob Kahler third. Johnson began to pull away from the field while Kyle Jarlsberg was making his way through the field. Jarlsberg moved into fifth just past the halfway mark of the race while Johnson continued to stretch his advantage. By lap 30, Jarlsberg was in fourth and challenging Kahler for third. Jarlsberg made the pass for third on lap 31 as he quickly motored under Scheel looking for second. Jarlsberg completed the pass on lap 32 as he looked to close on Johnson at the point. Jarlsberg cut into Johnson’s lead only slightly until lap 42 when the caution waved for the final time closing up the leaders for the final eight circuits. But Johnson flexed his muscle over the closing laps as Jarlsberg was unable to make a move for the lead. At the checkers, it was Johnson for the win followed by Jarlsberg, Scheel, Steve Dobbratz and Jason Erickson. 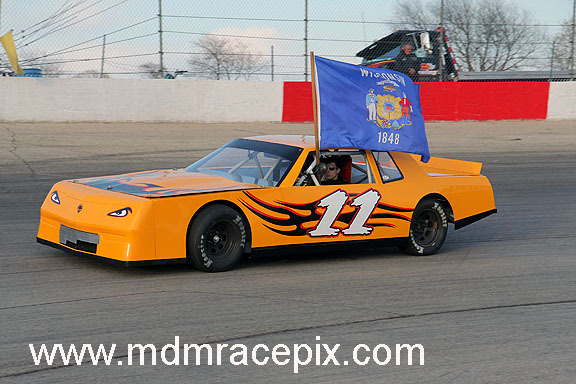 Jim Tate Jr of Deforest claimed his second feature win of the season by capturing the 30 lap Sportsman main event. Jeff Schultz and Terry Wangsness paced the field to green with Wangsness taking the initial lead as the exited turn two. Tory Bagley shot up alongside Wangsness as they raced down the back chute. After a brief battle, Bagley took control of the top spot on lap four. After a caution on lap seven, Steven Sauer attempted to get past Wangsness for second as he drove to the inside. A lap later, Tate joined the party for the runner up position as they drove three wide through turns three and four. Tate and Wangsness emerged side by side for second as Bagley tried to pull away. Tate gained control of the position on lap 11 as he began to close in on Bagley at the front. By lap 19, Tate was filling up the rear view mirror of the leader as he took a peek to the inside. Tate drew even with Bagley on lap 21 as he continued to inch forward. Tate finally cleared for the lead on lap 23 as he drove off to get the win. Bagley settled for second with Jason Thoma, Mark Deporter and Kody Hubred rounding out the top five. Mike Lambert of Madison made a late race pass to pick up the win in the 20 lap International feature event. Darren Brown led lap one from the front row with Devon Dixon and Dylan Buckingham battling for second. After an early caution, Dixon dove under Brown entering turn one. While the duo raced side by side, Matt McKinney made his way up to third. 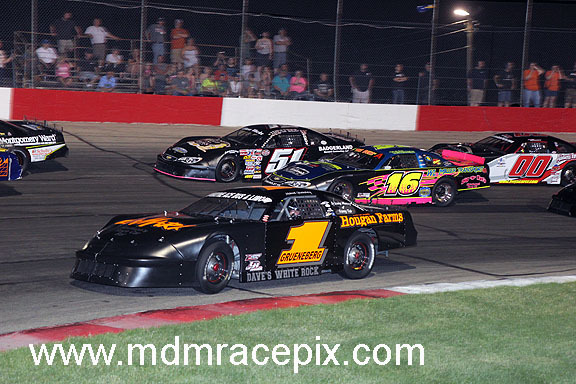 McKinney joined the fight for the lead as he drove to the inside making it a three wide battle for the top spot. McKinney and Brown emerged door to door as Dixon fell into the pack. McKinney took control on lap seven as Neil Higgins found his way to second with Lambert in tow for third. McKinney opened up a large lead while Lambert began to challenge Higgins for second. Lambert cleared for second on lap 10 as he looked to close the gap on the leader. Lambert inched closer lap after lap until finally catching McKinney with only four laps remaining. Lambert looked to the low side of the leader as he pulled alongside. Lambert cleared for the lead on lap 17 as McKinney tried to crossover and retake the position. But Lambert held him off as he powered to the checkers for the win. McKinney finished second followed by Seth Reamer, Higgins and John Handeland. In Hobby Stock action, Bobby Selsing Jr of Edgerton claimed his third feature win in as many weeks after winning the 25 lap main event. Jeff LeFave and Jamie Tate led the field to green with LeFave taking the early lead on lap one. Duane Deppe quickly moved past LeFave with Tony Ciano in tow for second. By lap three, Selsing was already running fourth and moving forward. Ciano found a lane past Deppe for the top spot on lap five as he brought Scott Riedner and Selsing along for second and third respectively. Selsing charged to the outside as he drove past Riedner for second. Selsing then dove under Ciano as he stole the top spot for himself on lap eight. Selsing immediately opened up a healthy lead as James Helmer eventually found his way to second. But Selsing was already checking out from the pack on his way to his third straight feature win. Helmer came home second with Ciano, Riedner and Lucas Buckingham completing the top five. Jefferson’s Rob Lange picked up the win in the 15 lap Road Warrior feature event. Jason Haas and Chris Gottschalk made up row one at the start as they battled side by side for the lead. Matt McKinney split the tow leaders on lap two as they drove three wide into turn one. Gottschalk slid up the track and drove hard into the turn two wall to bring out the sole caution of the race. Haas restarted as the leader with John Handeland in second and Bill Sweeney third. As racing resumed, Handeland drove to the high side of Haas to claim the point with Sweeney in tow for second. Sweeney slid under Handeland on lap four as Lange joined them watching from third. Sweeney claimed the lead on lap five with Lange following into second a lap later. Lange quickly went to work on Sweeney at the front as he peeked to the low side of the new leader. Lange drew even with Sweeney on lap eight, clearing for the lead as they exited turn two. Lange cruised throught the final laps to see the checkers first for the win. Tim Ellis finished second followed by Sweeney, Rodger Stephenson and Bill Reynolds. Devon Dixon of Janesville rounded out the nights festivities by capturing the 20 lap Bandit main event. Brad Birzer claimed the lead on lap one from the pole with Josh Lenz in second. Birzer saw the black flag on lap three when he began to lead fuel on the racing surface. Tadd Douglas shot into the lead as Birzer pulled off the track. Keith Erickson charged up to second on lap eight as he pulled up behind Douglas. The caution waved on lap 11 and while under yellow, Douglas pulled his machine off the track handing the lead over to Erickson with Lenz in second and Dixon third. As racing resumed, Dixon drove around Lenz on the outside setting his sights on Erickson at the front. Dixon tried to use the high groove on Erickson as well, but Erickson was able to fend off his challenge. With three laps to go, Dixon touched Erickson slightly as they entered turn three. Erickson got loose allowing Dixon to slip past for the lead. Dixon held off Erickson in the closing laps to see the checkers first for the win. Erickson settled for second with Lenz, Mitch Brockway and Dustin Yanke rounding out the top five. Next Saturday, May 26, is a full program of racing including the Veteran’s Memorial 75 lap Late Model feature paying $1000 to win as well as extended feature laps in the Sportsman division. Special event prices will be in effect. Time trials begin at 5pm with racing at 7pm sharp. Jefferson Speedway is located halfway between Jefferson and Cambridge on Hwy 18. Please visit www.jeffersonspeedway.com for more information.